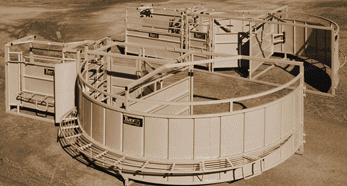 The cornerless crowding tub is an excellent addition to any livestock handling system. 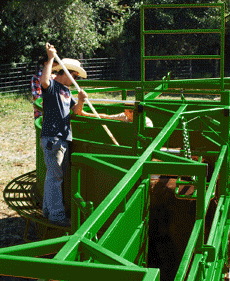 Real Tuff’s tub features solid sides which help cattle stay focused. 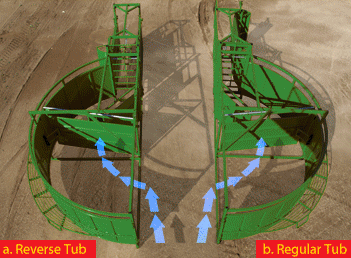 The design assists cattle to move in the correct direction without getting turned around or caught in the system. Two exit doors improve versatility and ease of use. Dimensions: 8.5′ x 16′ 1300 lbs. Portable tub and alley combo available. Video below shows the Real Tuff portable system demonstrating the Squeeze Chute, the Adjustable Alley and the No Corner Tub. Customers can the Squeeze chute, the Adjustable Alley and the No Corner Tub individually or as a portable unit. At Real Tuff we strive to keep up with current trends and adapting to changing customers needs. Please keep in mind that the equipment shown in this video may have been updated or slightly changed since filming to meet our customers needs. Each piece of equipment has hook-ups attached to easily connect to the next piece in your livestock handling system. Many cattlemen prefer to add an adjustable alley to the no-corner tub exit and then connect a squeeze chute. 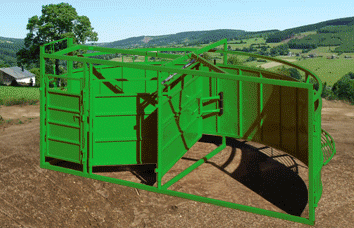 Cattle panels can also easily hook up to the equipment and are a great addition if you want sorting pens.